After learning, serving, and worshipping, Youth Service Day participants #DabForDanielle in support of local UMC youth. Each spring the OCU Wesley Center hosts two statewide events: OIMC Day and Youth Service Day. 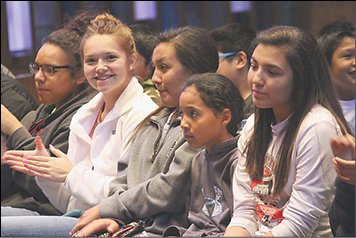 • On Feb. 25, hundreds of United Methodists of all ages from churches in the Oklahoma Indian Missionary Conference descended upon Oklahoma City University for a day of fellowship, food, and worship that included 3-on-3 basketball, a free-throw contest, campus tours, and more. 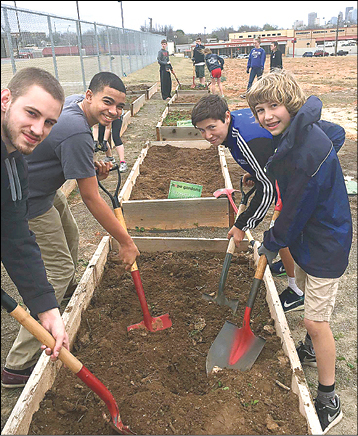 • The very next Saturday, March 4, nearly 100 youths from nine churches of the Oklahoma Conference participated in Youth Service Day, volunteering on mission projects in the Oklahoma City area. Both events were sponsored by the Wesley Center under the guidance of Elizabeth Horton-Ware, OCU’s director of religious life. All aspects of planning and implementation, however, were managed by the Wesley Center student interns — Monica Hiller, Joey Simpson, and Melaina Riley — including securing referees for the OIMC games, partnering with churches and agencies for the mission projects, and creating worship experiences that concluded each gathering. "I work with the interns closely through the fall semester on organizing smaller Wesley Center projects like Habitat for Humanity Day, Evensong Worship, and volunteer opportunities at the Regional Food Bank," said Rev. Horton-Ware. "By the time OIMC Day and Youth Service Day roll around, they are ready to take the reins." Around 20 additional students are needed to make each spring event successful. The interns recruited, trained, and deployed classmates as team leaders, campus guides, worship leaders, and hosts. "Using feedback we received last year from participants, we decided to do things a little differently this year," said Horton-Ware. "The interns developed morning classes in a number of topics that included the theology of mission work, tree planting, and prayer, and participants had the opportunity to attend two classes before heading out to their mission project. The response to the changes was very positive." Wesley Center interns now are turning their attention to Better Together Week in April, the last big servant leadership event of the academic year. Youth Service Day sends young volunteers into OKC to serve at non-profit and church sites. OIMC youths lead worship that concludes their special day at OCU.